In 2019, St. Ignatius 8th graders will have an amazing opportunity to not only study U.S. history during their academic year, but experience it as well. Next spring, 14 students and two chaperones will travel to Washington, DC, to visit sites, monuments and museums that they are studying in class. Miss Nava, 7th grade homeroom teacher, said, “I’m hoping that through this trip, students will develop a greater appreciation for the study and understanding of history and the ways in which history connects people.” The students will be in Williamsburg, VA, the first two days to watch and participate in performances of 18th century African stories, the Jamestown settlement and the Governor’s Palace. The next three days will be spent in Washington, where they will visit Mount Vernon, the Holocaust Museum, WWII Museum, Lincoln Memorial and the White House. They’ll also attend Mass at the National Shrine of the Immaculate Conception. The group is raising funds to help offset the cost of $34,400. 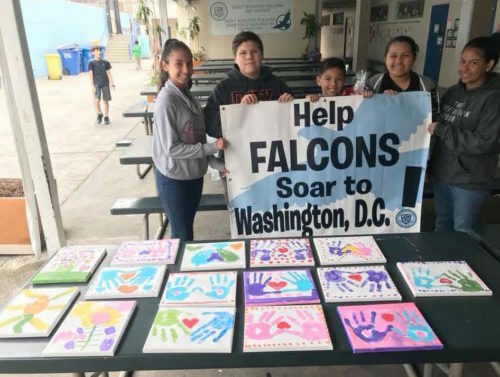 Anyone interested in sponsoring an 8th grader for the 2019 Washington trip can contact Mrs. Ileana Wade, Principal of St. Ignatius of Loyola Parish School, at 323-255-6456 or by email at gro.alsuitangitsnull@edawi. St. Ignatius of Loyola is a Catholic Elementary School serving children in Transitional Kindergarten through eighth grade in the Highland Park area of Los Angeles, California. St. Ignatius has been providing a quality education, challenging students to develop and share their God-given gifts in a faith-filled environment for over 90 years. In July 2011, St. Ignatius was awarded the highest accreditation – 6 years, by WASC, the Western Association of Schools and Colleges and WCEA, the Western California Educational Association.